Fire Extinguisher Cabinets. Fire Extinguishers Online - New Zealand. 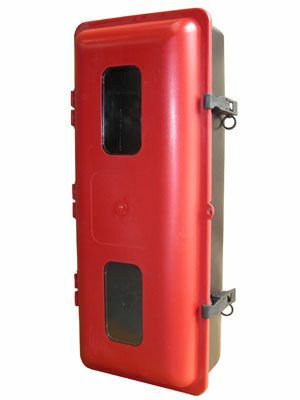 Metal Extinguisher Cabinet for 4.5kg extinguisher up to 9kg extinguisher. D245mm x W300mm X H700mm (all approximate). Manufactured from zinctec steel with Perspex front cover. Plastic Extinguisher Cabinet for 4.5kg, Dry Powder or 2kg CO2 Extinguisher. Interior: 513mm x 169mm x 150mm. including front glass cover. Plastic Extinguisher Cabinet for 6kg, 9kg Dry Powder, 9 Litre Foam, 9 Litre Water or 7 Litre Wet Chemical Extinguisher. Interior: 650mm x 225mm x 200mm. including front glass cover. Metal Extinguisher Cabinet for up to 2.5kg extinguisher. D160mm x W225mm X H495mm (all approximate).